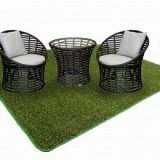 Add a realistic looking touch of nature to your outdoor areas, with our outdoor grass carpet mats. Designed to replicate a real lawn. 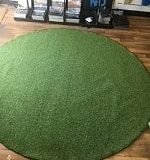 Our artificial grass carpet rugs will liven up any space. Perfect for all outdoor entertainment areas. Ideal matting for kids’ play areas, balconies, games rooms and garages. Grass mats can be used as a temporary covering. Or rolled out to the desired surface as a permanent floor cover solution. Synthetic outdoor grass mats are also often used at events to create green space or cover uneven surfaces. Simply brush or hose down your rug to keep it looking good. Perfect outdoor mat for pets. Various sizes available or you can custom your size. Our best-selling sizes are listed on our site. However, we can work with you to manufacture an outdoor grass mat to meet your specific needs. Free shipping Australia wide on our range of synthetic outdoor grass mats.